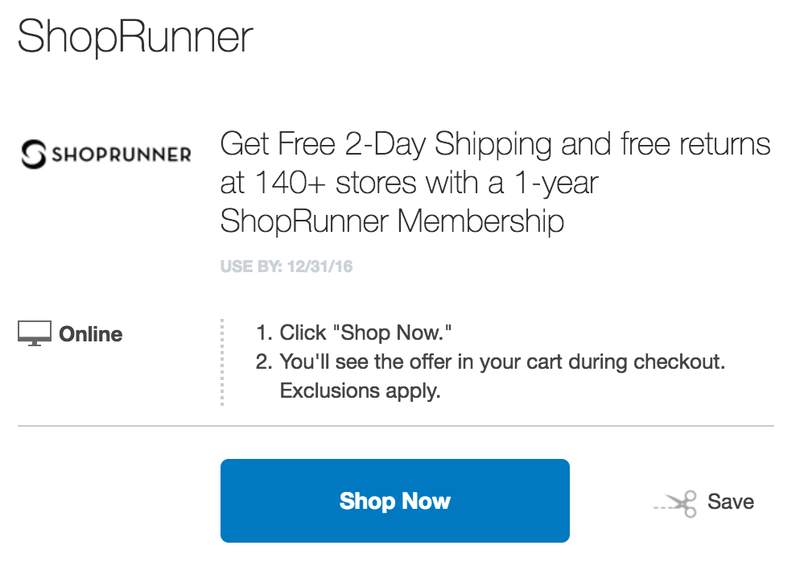 PayPal is currently offering a free one-year subscription to ShopRunner’s two-day shipping service. It usually costs $80 for a full year. Today is your last chance to take advantage of this deal, so jump on this offer now and cash in on fast deliveries throughout 2017. Simply visit this landing page, click on ‘use’ and follow the on-screen instructions. American Express cardholders already have this benefit built-in to their membership. With ShopRunner, you’ll be able to enjoy two-day shipping from popular online retailers like Staples, Newegg, Ralph Lauren, Eddie Bauer, and many more. While it doesn’t have all of the perks of a Prime membership, it’s worth it to grab for free if you’re an avid shopper. We may offer certain customers various trial memberships, which are subject to this Agreement except as otherwise stated in the promotional offers. We may offer such trial memberships at no charge. Trial memberships are limited to one per person. If you are an invited household member of a ShopRunner member you are not eligible to receive a free trial membership. We require you to provide your credit card information when you register for a trial membership. ShopRunner reserves the right to reject or terminate your trial membership at any time, for any reason or no reason.